One hundred and seventy-two years ago. And yet so much detail! How is that even remotely possible? The answer: the German civil registration records. Records with a wealth of detail that’s almost impossible for those of us with plain-vanilla American ancestors (like so many of mine on my mother’s side) to even imagine. Want a father’s name? It’s usually there. A mother’s name including maiden name? Usually there. Ages? Yep. Occupations? Yep again. Who gave the information for the record? Yep again. Witnesses, if any? Yep. And their occupations and citizen status too. Civil registration of births, marriages and deaths began in Germany during the French occupation of the late 18th and early 19th centuries. The earliest civil registration records were in 1792 in Alsace-Lorraine; the latest areas to adopt civil registration did so by 1876.11 In Bremen, the city of my grandmother’s people, civil registration records go back to 1811. The very earliest records can be challenging even to someone with a decent working knowledge of the language (or a really good German-English dictionary). They tend to be all handwritten and the German script is, well, challenging is a good word. (I can think of others, but they’re the kind of words that used to get my mouth washed out when I was a kid…) The script can still be a headache on later records, but — as you can see here — much of the information on records even as early as 1840 was entered on preprinted forms. And, for the most part, the clerks entering the information wrote pretty clearly. You don’t have to be fluent in German to work with civil registration records. Knowing the key words (geburten = births and heiraten = marriages, for example) will speed up your work, but working through the text word for word with a dictionary is definitely do-able. There are resources on the internet to help with handwritten German script. Omniglot is a good place to start. 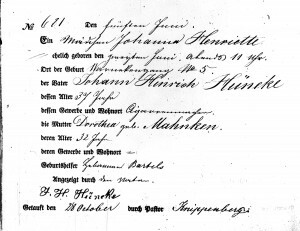 And the FamilySearch Handwriting Guide: German Gothic is a good resource as well. For long records with a lot of handwritten information, working with a translator can be extremely helpful. What I found most helpful in dealing with the handwriting was identifying all of the words and phrases in records that I simply couldn’t make out and having a translator both transcribe and translate for me. That way, when I ran across a word or phrase in a later record that I’d already come across in an earlier document, I had a ready reference source. Is it easy? No. Is it frustrating? Often. Is it worth it? 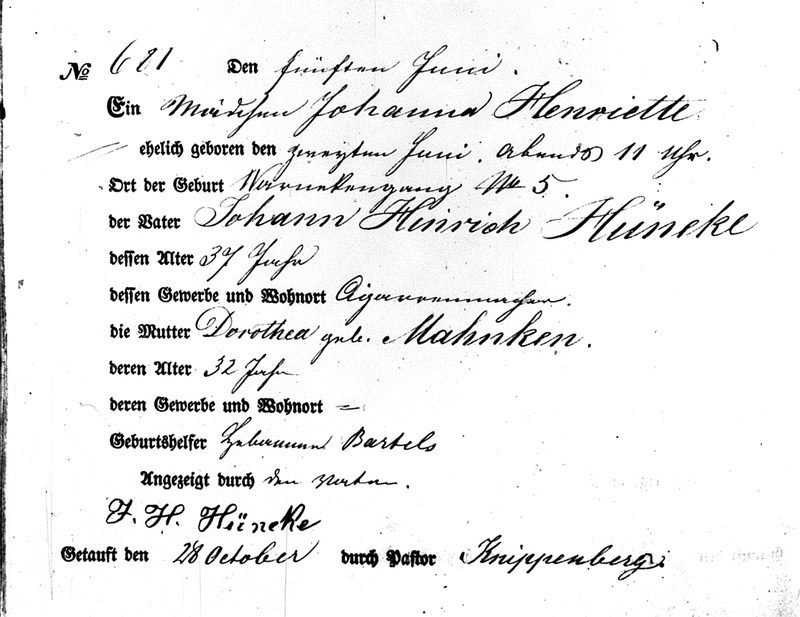 Using only the civil registration records, not only can I report on Johanna and her 1840 birth and baptism, plus those of her brothers and sisters (including a younger sister12), but on the marriage of her parents Johann Heinrich Hüneke and Dorothea Mahnken in 1834.13 That earlier marriage record, in turn, identified Johann’s parents as Heinrich Hüneke and Anna Margarethe Glade and Dorothea’s parents as Cord Mahnken and Metha Pingel. Danish records are also a gold mine, up there with the German of these time periods. Also the German passenger/shipping records. Many Danish has to get permission to leave Denmark (registrations required and records listing names/destinations/birth locations) and departed out of Hamburg Germany. And then there’s my 1732 US arrivals of Palatines (surname, KUHN)… we have only the slightest unsourced bit of an inkling clue of a town/village/area named Schlaitdorf for one of the many-greats. Doesn’t mean much, but it’s a clue. These 1800s details are so wonderful for research, Judy – so many clues to help you provide context to your ancestors’ lives. Really exciting! Happy dances everywhere, eh? Happy dances for sure, Celia. And if you do nail the town of origin, check the church records. They go way back beyond civil registration! I know this point is a few years old, but what website are you using to find the records? I used one for Bremen (my ancestors lived there) a year ago, but I’ve completely forgot what website it was. It’s in the footnotes: Die Maus, the Gesellschaft für Familienforschung e.V. Bremen. Ah. But where on the website? Some of the footnotes you put, like the funeral records, their links are broken. The funerary records (Die Leichenbücher der Stadtgemeinde Bremen ab 1875) are under the Datensammlung menu. And some records you need to be a member to access.